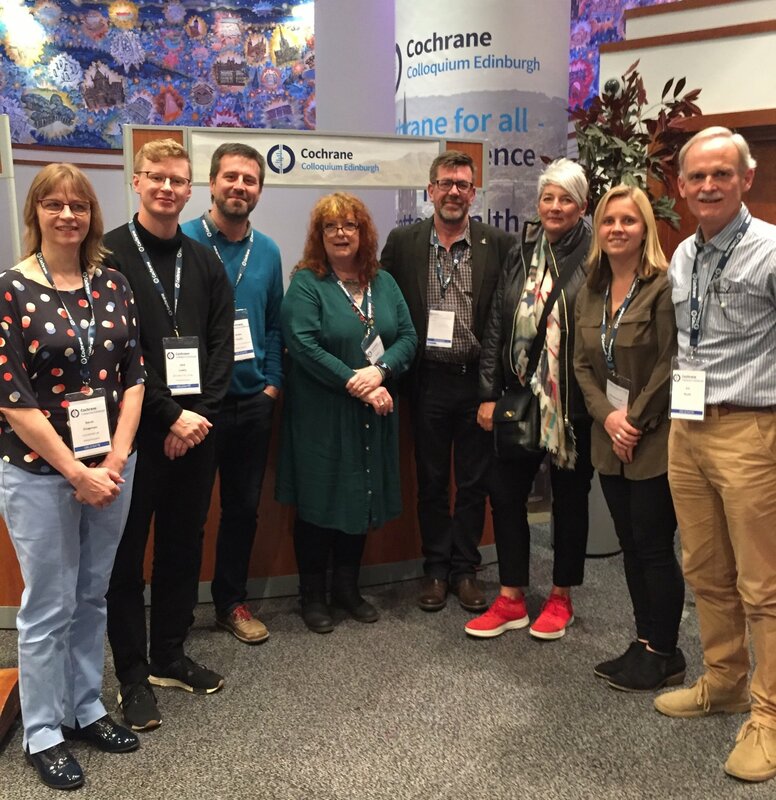 Cochrane UK’s Sarah Chapman and Selena Ryan-Vig took the recent Cochrane Colloquium ‘Beyond The Room’, as part of a team of eight. With insights from their intrepid team mates, they consider what this extended social media activity achieved, what they would do another time and why, as Sally Crowe said, they “might be a little bit addicted to it”! 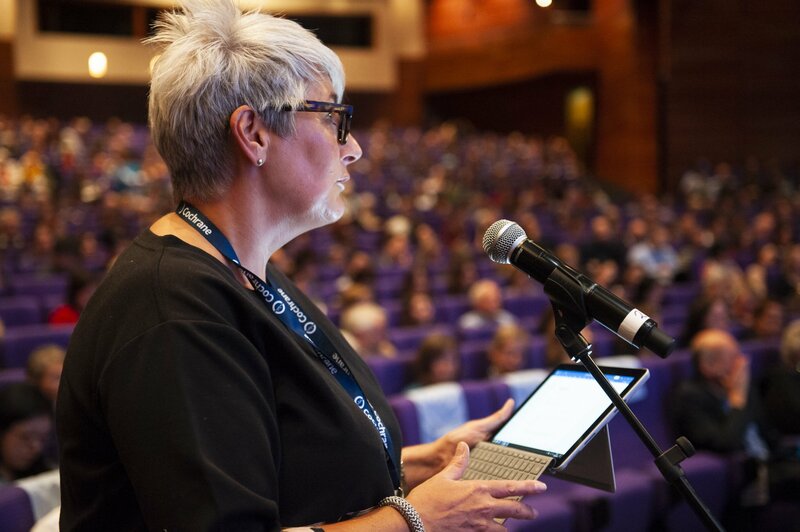 Deep within the Edinburgh International Conference Centre, in a gathering of almost 1300 people, eight met in their team bunker, armed with phones, laptops, too many cables and an endless supply of coffee, on a mission to take the conference Beyond The Room. They aimed to facilitate a richer and more democratic conversation that actively involved people attending the conference in person and many more via social media, and to extend the reach of the event. At Cochrane UK, as hosts of Cochrane’s 2018 global conference, we felt this was particularly important given that, for the first time, this was a ‘Patients Included’ event. Back in the spring, we put out a call out for applicants to join the Beyond The Room team, looking for students, health professionals and consumers who were experienced tweeters and could hit the ground running. Knowledge of Cochrane wasn’t essential, and we were aiming for a team with a mixture of skills and interests. Fast forward to September and joining the two of us, and André and Douglas from the Beyond The Room service, were our four recruits, Sally, Casey, Jack and Kit. After some pre-conference preparation came our first meeting as a team, some decisions about our roles, and then three days of frantic activity at the event, including tweeting, podcasting and gathering questions electronically to put to the keynote speakers. So now the cables are stashed away and the coffee machine silent, how do the Beyond The Room team members feel it all went and what do the metrics show? Over 2,500 people joined in tweeting using the #CochraneForAll hashtag, sending over 12,700 tweets (and around 8,900 retweets) which gained over 56 million Twitter impressions . You might wonder whether this was mostly just the delegates, tweeting away to one another, but an estimated 80% of tweets came from Beyond the Room. Individuals joined in from 84 countries, with over half of the tweets coming from outside the UK. The top ten contributors were: UK, US, Canada, Australia, Spain, Russia, Chile, Ireland, Mexico and France. We’re pleased to have been able to take the conversations far beyond Edinburgh, particularly given the time differences, and hope those not in attendance felt as included as Twitter user Derek Stewart who remarked “I was there but just not ‘there’ in Edinburgh”. There was a strong feeling amongst patients and carers who helped us plan our conference that standing up to ask the speaker a question can be very intimidating, a feeling many of us share! One of the things we were enthusiastic about doing was encouraging people in the room to submit their questions electronically during the talks, via menti.com, and others to tweet their questions, which one of us added to Menti. One of the team then stood at the microphone (well someone had to!) and put some of the questions to the speakers. We felt this was well worth doing. Questions came from people who would never have taken the microphone, and the format demanded the sort of brevity and focus that may not be displayed by people voicing questions. Although the opportunity was there, not many questions came via Twitter, and I (Sarah) found it hard to find ways to encourage people to ask, without leading them down a particular path of questioning! Better preparation and more experience would help here, I think. Having questions projected on a screen for all to see, as they come in, is a possibility with Menti and one we considered – it comes with risks, but might generate more questions and discussion. We knew we had some podcasting experience on the team, but hadn’t really appreciated what a huge asset this would prove to be. Casey certainly lived up to her name in this activity (amongst others!) and André, no rookie podcaster himself, was quick to note that he learned a lot about interviewing and podcasting from Casey. Top tip for anyone hoping to do this – get yourself a former TV news field producer and stand-up comic on your team. If this proves tricky, do your best to find an alternative skilled interviewer and podcaster! 18 podcasts were made and shared, including interviews with the keynote speakers. These created a buzz at the time but have also been important in enabling the conversation to continue, being reshared after the event. Having transcripts of the podcasts makes them accessible to a wider audience but these take time. We were able to produce a couple at the conference but the rest are being done in the weeks after. “Having such a diverse team was brilliant – it certainly enhanced my experience, and I believe also our output. It also meant that we came at things from different angles, and it was good that we were all prepared to challenge (albeit politely!) ‘givens’ and assumptions” (Kit). Sally commented that most of the conversations she had on Twitter were with people outside the room and that she liked being able to bring their reflections into the conversations at the event. We felt we would have liked to be able to get the voices of more delegates heard beyond the venue; ideas for another time include doing more interviews with participants, more informal conversations with permission to tweet about them, and perhaps trying a buddy system, pairing a ‘social media person’ with a patient/carer to attend the conference together and tweet as a team. Beyond The Room was just one aspect of trying to shift the culture at what is essentially a huge scientific conference to make it more inclusive. 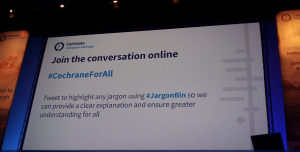 Something that seemed popular was the use of the #JargonBin hashtag, which was a way of encouraging people to use Twitter to flag up any jargon they heard, and a means of providing a plain language explanation. Overall we felt that our activities did take the conference to a wider audience and encouraged participation, but perhaps we could have better targeted online communities who would engage with high quality discussion about their health area of interest. “[It] brought a bigger and more diverse audience to the event… [and] forced the speakers to engage with the public and adapt their content (some did this more than others) so it was accessible to all” (André). We all agreed it was a great experience for each of us on the team, and we are encouraged by the many positive comments about it – and lack of negative ones! What if offered went beyond the practical, we think. 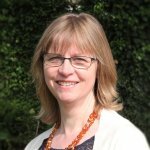 “I hope that it signalled a change of direction for Cochrane more broadly…” (Sally). Beyond The Room seemed to be a barometer for change at the Colloquium whilst also contributing to that change. We can’t wait to do it again! Join in the conversation on Twitter with: @sally_crowe, @MightyCasey, @TheJackLeahy, @Laconic_doc, @Mental_Elf, @DBadenoch, @SarahChapman30 and @CochraneUK, or leave a comment on the blog. You can read more reflections on the Beyond the Room experience from Sally Crowe here and from Casey Quinlan here. This is insightful summary and I did follow some of the tweets from my home and made some comments. What concerns me is that the event itself wasn’t fully inclusive with live captioning a well used means of ensuring transcripts are enabled for both live streaming and for podcasts this is not new and provides for those attending with any auditory processing/deaf/difficulties unsderstanding accents especially when English is not first language it has a multiple benefit for so many and ensures true inclusion for the tick of patients included. There is a company already providing this skilled service. Please please when you do an inclusive event factor in live captioning as a must not an after thought ensure budget to meet costs or even better ask a sponsor to pay as it’s excellent PR for that sponsor too! There is a solution to everything especially to ensure inclusive communication. I completely agree Helen and this was an early reflection after the event… Sorry we missed it this time (and feel rather cross with myself that we did! ).